Thatslyf | 14 Cartoon Series of 90s That We Miss badly Today..!! 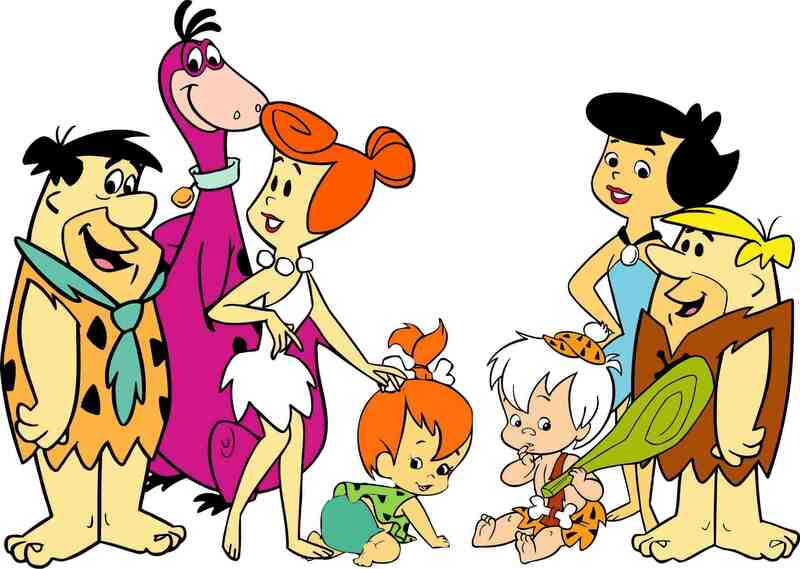 14 Cartoon Series of 90s That We Miss badly Today..!! If you are a 90s kid you would agree that our childhood has been marked with the best possible memories and interspersed with highly decorated visuals of our time cartoon series and childhood dailies. These were not only fantastic to watch but also relished like an icing on the cake. 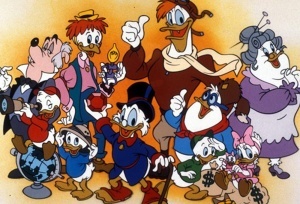 The cartoon series now-a-days have seen a vast change from the level of its animation to the story telling techniques. Here we are presenting the list of a few of 90s enigmatic cartoon series which surpass and win hands down when compared to this age cartoons. 1. 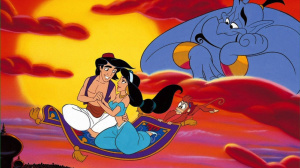 Aladdin: Set in the Arab desert this cartoon series stands out and was the favorite and number one in its time. From the adorable Genie to the beautiful Jasmine and from the magic of the flying carpet to the cunning Yago, the characters were and are still embedded in our heart. The mesmerizing song Arabian Nights is still one of the most loved songs of our childhood. Watch out for Aladdin!! 2. Mickey and Friends: If there is anything better than the best, it is the Mickey and Friends. 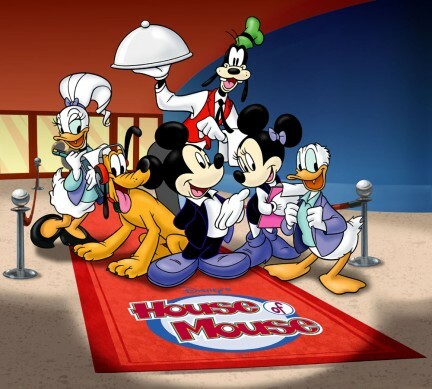 The transition from humming Mickey wearing the red shorts to the clubhouse owner Mickey and from Goofy who taught us various ways of golfing and catching a fish to the annoying Donald Duck, all are missed today. 3. Ducktales: Uncle Scrooge and his swimming abilities in his wealth was awe inspiring. The trio of Lui, Dui and Yui and the deadly beagle boys, the cunning Magica and the crash master Launchpad are even today the love of life. 4. 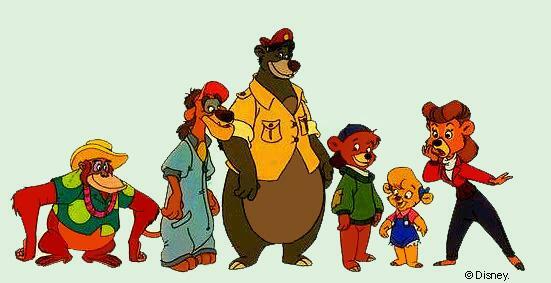 Talespin: A bear flying an aircraft was not the wildest imagination after all and the powerful Sherkhan is not long forgotten. 5. 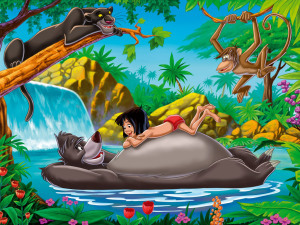 Mowgli: Rudyard Kipling would have not thought that his character Mowgli would one day become the most loved boy of not only the jungle but also every house in every nook and corner. Bagheera and Mowgli’s chemistry has always been a lesson of friendship. 6. 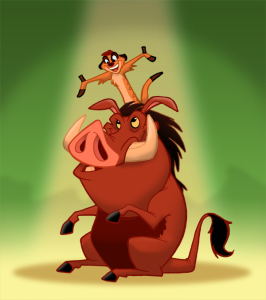 Timon and Pumba: One of the most hilarious shows by Disney, Timon and Pumba stands out as the show that taught how friendship never saw shapes and sizes and how two entirely different entities could be bonded so strongly in a bond of selfless friendship. Hakuna-Matata, Timon and Pumba..!! 7. Tom and Jerry: A timeless show that hardly needs a description. Friends and pals or be it the ever so vaguely understood cat and mouse chase, this show has surpassed its mere name and is something bigger than just a show. 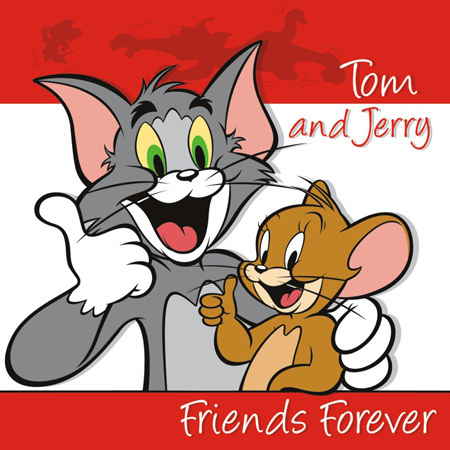 Tom and Jerry are as inseparable from us as they are from themselves. 8. 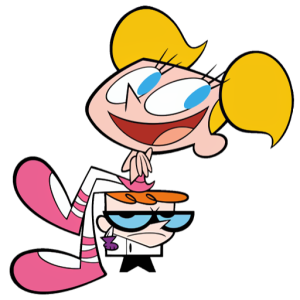 Dexter’s Laboratory: The intelligent secretive brother and the annoying destructive Didi formed once a good pass time for kids our age. 9. Power-Puff Girls: Some experiments don’t need to go wrong to give us the right ingredients of power packed action series. 10. 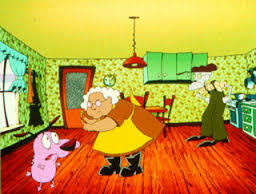 Courage the Cowardly Dog: American horror comedy based on couple Muriel and Eustace Bagge who lived in a secluded village and owned a dog named courage. The show was loved for its weird and bizarre theme and sometime eccentric story telling techniques. 11. 101 Dalmatians: This cartoon series has charmed the audiences for the love of the Dalmatians and the witch hunting Cruella De Vill and her villainous plotting schemes which were hardly ever a success, thanks to ‘Lucky’ and his friends. 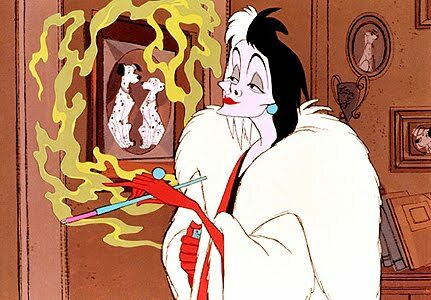 This is the only show which had a sequel run of 102 Dalmatians and was equally successful. 12. 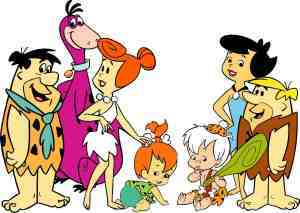 Flintstones: Who would have thought that the stone age would be so lovely with the family like set up of Fred and Berney. Hard to imagine everything stone? Watch out this one. 13. 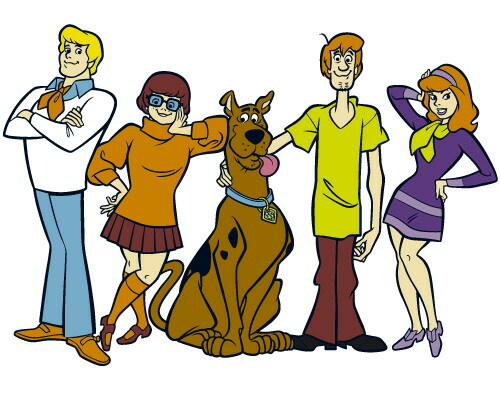 Scooby Doo: The only mysterious series that out run many shows of its time. The Yabaa dabaa Doo time to solve some crime. Scooby doo, where are you? 14. Popeye: What other thing could have done the awesome work of teaching the kids the importance of eating spinach than basing a full cartoon series around it. 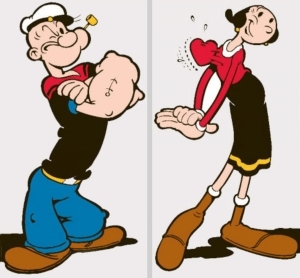 We all loved and enjoyed how Popeye could get his Olive freed from the brutal Brutus’ clutches just by pumping in some spinach into his blood. Popeye the sailor man..we miss you a lot. These are just a few names as the list can be endless. Not only are they better than several cartoon shows presently running in terms of animations but also better in terms of story. Cheers to you if you are a 90s kid and have watched and laughed and grown up with these shows coloring your childhood. Grab hold a remote and look out for some cartoons and relax and enjoy your childhood once again. Bring smile to your face and laugh till you drop coz laughter, well thatslyf. yaar yeh cartons wala to mast hai. Kya khoob yaad dilayi bhai ne. What a post!!! It reminded me of my childhood which was complete because of these cartoons. Lovely post.. thanks for making me go back to the memory lane!! wow..hhow time flies..rreminded me of my childhood days..